Enock, a paraplegic climber with Spina Bifida, takes us on his journey to climb El Capitan in Yosemite, CA. El Capitan. A team of amazing people. A movie. I have been struggling with how to describe such a life changing, mind-boggling experience. I want you to know how it feels looking out at Yosemite Valley from over a thousand feet up, hanging from a single rope. I want you to feel the updrafts that pushed the portaledge, making it seem as though I was floating. I want you to see the brightest stars you have ever seen, and to trace the sun as it peeks around El Capitan in the mornings and hides on the other side after a long, exhausting day. 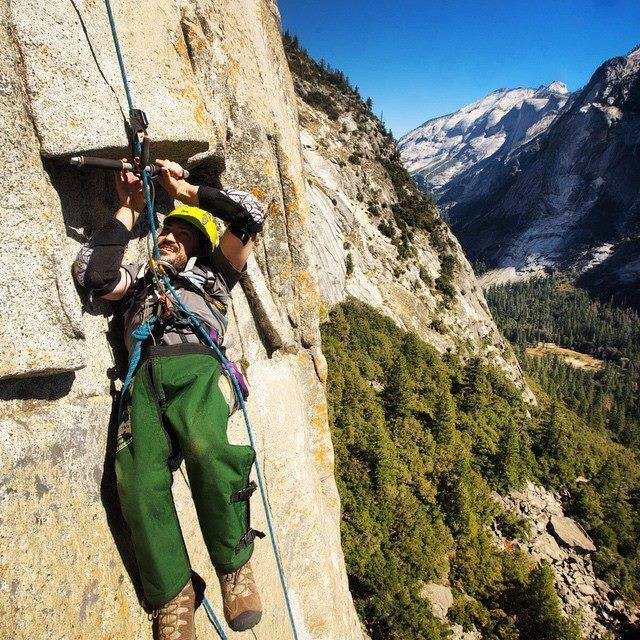 I want you to experience the details – the succulents and grass growing from the rock, the “crack swallows” as they swarmed around me while climbing, and the realization, during a spectacular sunrise, of why the Dawn Wall was given that name. I want you to experience the struggle, and the people that helped me make a dream into a reality. I will try to convey some of these feelings, and visions, and experiences here. First I have to begin with a word of thanks. I have spoken of my selfless friends before, but they deserve mentioning again and again – there are never too many thanks when the gratitude I feel is endless. I had 12 people from all over the country come to help with this ascent. Some of these people I didn’t even know. They just heard about this mission of a parapalegic with spina bifida to climb El Cap and they changed their vacation plans to help. This wouldn’t have happened without these people and I am truly thankful to each and everyone. In the first nights of this trip, we stayed in North Pines Campground. One evening, while we were hanging around camp, a lady, who also uses a wheelchair, and some of her friends dropped by. Out of the darkness, I heard “Are you Enock?” in a heavy Italian accent. I looked at the lady and replied “yes.” I wondered how she knew me? She explained that she had heard about my climb on the internet and decided to be there to do her own climb of the same route. That was the first moment when I realized that, by putting myself out there, maybe I could encourage others to try things they may not otherwise think possible. We conversed and I learned her name (Eleonora), the origin of her injury (about one year prior she was injured in a climbing accident), and that she really did come all the way from Italy to climb El Capitan. We also learned that they wanted to start up the same day we had planned. Eight people all starting up the same route would definitely end up being quite a traffic jam. After they left, we decided to move our schedule up a day to October 4th. This helped solve the traffic jam issue, but now it meant we had one less day to get everything together. The next day we ran around the valley trying to get water, food, and all the other supplies we were lacking for the climb. Surprisingly, we did it. The morning of October 4th we were up bright and early and headed to the meadow. I was very emotional when Craig Muderlak was talking to me and filming. I had waited for this day for so long and worked so hard to make sure I was ready - the moment was finally here. The carry team had me to the base in just a couple hours, and the first ropes were already set up by Christian Cattell. We were set to go. Originally we were to go as a team of four, but one team member was recently injured. We were unable to find replacement and decided to go up as a team of three. This meant that for a good portion of the climb I would be “on my own.” I wouldn’t have anyone climbing beside me, as originally planned, but Craig would be nearby in case I needed something. Naturally the play-by-play of 4000 pull-ups (800 per day) makes for an exciting story – just kidding! But, some may wonder what it took to pull that off. Training for 2 years! But, it wasn’t actually the pull-ups I found to be hard. The part I wasn’t prepared for, and really couldn’t train for, was being hundreds of feet in the air, sometimes 40 to 50 feet from the wall, while I was climbing. At times, that was quite scary, especially when the wind picked up and start spinning me. Yes, I stared a lot at at my pull-up bar and the rope, but I was also able to experience amazing scenery. For those of you that don’t climb, I can only say you are missing out on a really special way to see the world. I saw places that I never knew existed in the valley. Everything looked as though it was meant to be there, as if there was some order to how the world was put together. The imperfections disappear. And, the rock up close is much different than you see from the meadow. It is full of colors, from the lichen in greens, yellows, black, and orange, to the different shades of grays and whites. Prior to climbing El Capitan, I had no idea that plants, other than lichen, grew up so high on the rock. There were multiple kinds of succulents and grasses growing from little crevaces. The cracks seem to hide and house life. “Crack swallows” made their homes in some of the larger openings and would fly and swoop around us in a rhythmic dance. It was if we were part of the show, on the inside looking out. Portledges were an important piece of our equipment. We slept on them and I also used one between pitches to lay on. I did this to prevent sores from long-term sitting (I am happy to report I came out sore free.) 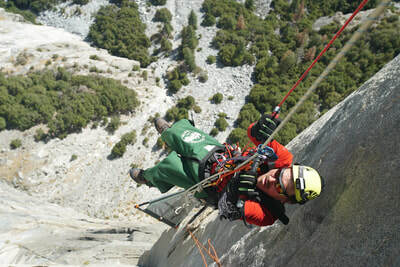 During the day, while I was splayed out on the portaledge, the powerful updrafts would push up on my back. Then, at times the wind would catch the portaledge like a sail, pushing it up into the air, making it float. Each morning I’d roll over and watch the sun cross the valley rock, come around El Cap, and light up the Dawn Wall in a fiery glow. At the end of every day, we would set up camp on 2 portaledges. I took care of my stuff, but Christian and Craig did the bulk of the setting up. We cooked with a Jetboil and ate mostly add-water type meals. We had oatmeal for breakfast and lots and lots of water - 20 gallons in total. We actually ended up having leftover water, which means we probably didn’t drink as much as we should have. But we didn’t "bonk out" (a term climbers use for when we don’t eat or drink enough and have to stop climbing). During the day we snacked and I loved the cereal bars. Since we are talking about food and water, now, I will get brutally honest. The bathroom routine is quite different when you are living on a 4 ft by 8 ft space. It is very difficult to get dressed or really do anything in that small of a space when you can’t stand up. Your body is already taking up a huge chunk of the space. But going to the bathroom was definitely one of my main concerns about this climb. I brought along a plastic camp toilet that we put garbage bags in with laundry detergent for smell reduction. Essentially this is where you get to know your partners very well. I do want other disabled people to know that it is doable, as long as you plan ahead. Pitch seven is considered the go or no-go moment, where you must decide if you are going to bail or if you are going to keep going to the top. It is apparently much harder to get back down after this pitch. I had been thinking about this crux moment for the last six pitches. 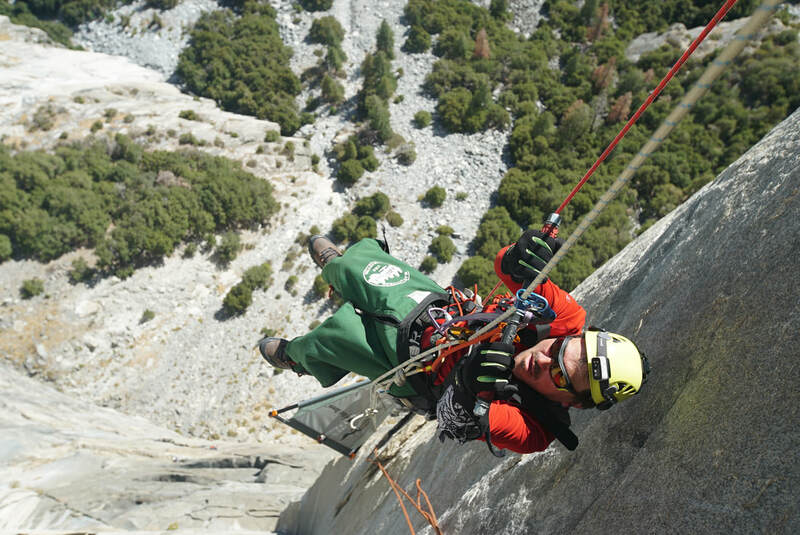 We were on the portaledge when I had to decide if I had what it took to complete nine more pitches. Christian and Craig broke the ice and I instantly felt sick to my stomach. We went back and forth with “it’s up to you buddy,” and “we will support whatever decision you make” statements. I kept saying, “I don’t know I feel sick.” I told them that a lot of people put a incredible effort into getting me here and I don’t want to disappoint them. Once I committed and began climbing, my stomach was fine. I had been psyching myself out, which shows the amazing the power the brain has to make or break a person. In addition to straight-up climbing, I also had the opportunity to belay for Christian and to help him with hauling the haul-bags. I was making it to the anchors pretty fast, so I would grab the tail end of the cordelette that was being used to haul, and did my best to at least help. My belaying experience was something to remember. I was taught to leave a bit of rope out so when it hung it made a smile between me and the climber. This was not the correct method for El Cap, as I found out the hard way. I was belaying Christian as he was setting my next rope. I can’t remember which pitch, but it was way up there. He yelled out “falling!” and, in the position I was in, I could not reel in the little bit of extra rope fast enough. As you can imagine, a person falling on a rope them has some force to it. So that extra rope acted like a catapult and shot me off the portaledge. I was tied in, but definitely scared me and I am sure Christian too. I did catch the fall, and all was well after Craig grabbed the rope and pulled me back to the portaledge. That was my last belaying experience on this climb. We topped out after 5 days on the wall. I am not sure I can capture that feeling in words. Even as I write this, I am tearing up remembering coming over that edge. But it wasn’t a smooth, easy transition. The edge seemingly did not want to let me over. I struggled more in that last foot then I did for the other 1799. Once I crossed over the edge and laid there, the magnitude of the accomplishment hit me. I couldn’t hold back the emotion. Neither could Craig and Christian. We all hugged and cried. After 2 years of training, disappointment, and exhilarating moments I finally got to see the top of El Capitan, and the view is like nothing else. Half Dome, off to the left, seemed so much more majestic. Trees greeted us, as did a bird that used its beak to dig around in the soil for something to eat. And, although the scenery was out of this world, the comradery of a group of people who had just accomplished something big, was as big as the universe. They say the climb is only half over when you’ve reached the top. This is true, and, based on the heading, you might guess the descent was not that much fun. Well, you would be correct! We descended off the east ledges, which is where just about every climbing group gets off the top. I was strapped into a rescue litter, just like I was for the carry to the base. However, this time I was strapped in there for nearly 17 hours. I basically had to turn within myself and just let the descent happen. I was very quiet the entire time unless spoken to. There were sections that required lowering me with ropes and sliding me down. It was so dusty that at some points I felt as though I was choking and it was hard to breath. 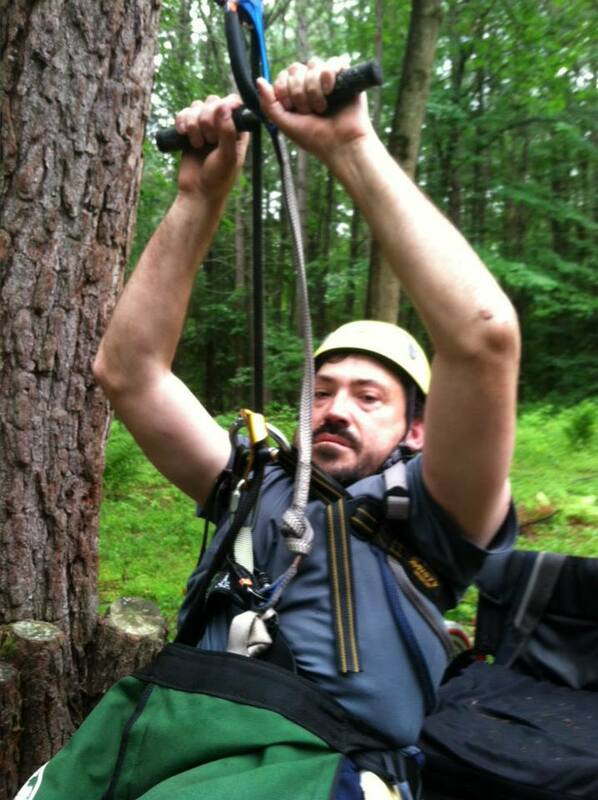 There was also a series of rappels (about 400 feet), which Christian skillfully guided me down. Rappelling was the easiest part for me. When we got to the bottom of those rappels it was dark and the groups of people up above were knocking rocks down onto us - rocks barely missing our heads. That was the scariest part of the descent. I had no way to move and couldn’t look around to see where things were coming from. Frank Robertson stopped a falling rock with his thumb. I was pretty impressed that he took it in stride and just switched hands to keep carrying. Then there was the Manzanita. Everyone ended up with cuts on their legs. At some point, a piece got wedged under my back and, for some reason, I just took it. I could have easily asked someone to remove it, but maybe I was trying to join in the suffering. Gary Dunn met us at the bottom with some other carriers and food. He organized the whole descent team and had everything in place for it to happen. Everyone that was involved in this descent worked so brutally hard for all those hours. They did this all because they wanted to make sure I was safe and got to live out my dream. It is the epitomy of big hearts and kind spirits. I am ever grateful and I hope I can repay their efforts some day, in some way.